Another group that was here very much throughout history were the Sirians. The symbols they used throughout time were usually of serpents or dogs. Physically, as a generality, the Sirians had darker skin, darker hair and eyes, and were not as large as the Lyrans. As far as their personality characteristics, we would say that they were very devoted to serving mankind. Whereas the Lyrans were committed to ruling mankind, the Sirians were interested in helping or sometimes even saving mankind. They could be very, very zealous, and because of that trait, they often interfered where they did not belong. But you could say they were the crusaders for mankind. The other significant group that we will mention are the Pleiadeans. Their symbols were also at times birds or winged figures. They also used the symbol of the seven stars. Physically, and again we must generalize, they were similar in skin, hair and eye color to the Lyrans but much smaller. So, for instance, a typical Pleiadeans woman would look very much like this channel in size. Now the Pleiadeans had a very, very deep love of mankind. It would take too much time to explain why, but genetically they are connected to you, so often throughout history they have been drawn back to Earth in order to help humans. Not only do they have a genetic connection but they also have an emotional connection. They always tried to nurture and protect you like a mother. Now you know that you may have two parents, a mother and a father who love you very much, but at the same time these two parents may also fight over you. Sometimes they may even manipulate you to get back at the spouse. The same thing happened with these ETs. They often, in their love for you, fought over you. Unfortunately, they also at times manipulated you. Because the ETs often fought amongst themselves there were often territory disputes about the land and the people of Earth, and so often the Earth was divided into sections and certain ET rulers would be responsible for certain sections. It is unfortunate that a lot of the information about these times has been lost. However, some of it remains in the Sumerian texts and we will talk a little bit about that later. We are going to begin our story by talking about Atlantis. Most of you are somewhat familiar with what happened in Atlantis. Generally speaking, there was a lot of extraterrestrial fighting going on during that time. There was also a lot human corruption going on as well. Many of you have already heard about the destruction of Atlantis and we are not really going to get to talk in depth about why Atlantis was destroyed because in some ways it is another subject. But we are setting the stage for the other information that we would like to present. Now some of you are familiar with the Christian story about Noah. As the story goes, Noah was warned by a serpent and told to build an ark. Everyone thought Noah was crazy, but he built his ark anyway; as the story goes, because he built the ark he was able to save humans and animals. Now he built the ark at the same time as the destruction of Atlantis – the Great Flood. Obviously, a serpent did not really tell him to build an ark; but as we previously said, the Sirians used serpent symbols to depict themselves. There wasn’t just one Noah, but many humans around the planet who received the Sirian message to build arks, for the Sirians really wanted mankind to be saved. It is unfortunate to say, but the Lyrans did not want mankind to be saved. They were not going to tell anyone about the flood that was coming. To simplify the reason for this we will simply say that the Lyrans preferred to start over again with Earth and that is why they were going to allow the destruction of mankind. You all know the story about Noah and that he was successful. Many humans around the planet were spared from the flood and they were still able to flourish as a race. It took some time but eventually major civilizations came into being again. The main historically recognizable one was Sumeria. At the point where Sumeria began flourishing, the ETs began coming back to Earth; mostly Sirians but also some Lyrans. The territory disputes began again and they had to divide the Earth into regions that different ETs began to rule. Once again the ETs began fighting amongst themselves, and once again mankind became like puppets. Many, many, many of these stories are recorded quite clearly in the Sumerian texts. They have not all been translated but some of them have been. We are aware that there is a book on your world and we believe it is translated into Japanese. The title of it is The Twelfth Planet. The author is Zecharia Sitchin. If any of you are particularly interested in finding out some of the juicy dramas that occurred in Sumeria you will find them in this book. We would like to use Sumeria as the beginning point for modern history because so much of the ETs’ conditioning of humans was absorbed during Sumerian times; some of that is still being played out today, unconsciously. First, let’s talk about the pyramids. In ancient days in Sumeria there were structures very similar to the pyramids that you now find in the Yucatan. They had flat tops which were landing areas for the extraterrestrial spacecraft. All of these pyramids are now buried, mostly in the area you know as Iraq. Many of them are really in ruins. You might not even recognize them as pyramids. However, you still have the Great Pyramid. Anyone who has ever visited Egypt may have sensed that the pyramid is not necessarily Egyptian. You know if you have been inside it that there are absolutely no inscriptions on the walls. In fact, there is no architecture at all that even suggests anything Egyptian. That is because the first version of that pyramid was built during the time of Sumeria. It is much, much older than scientists know now. It has been reconstructed several times. However, that pyramid was used for at least a thousand years, if not more than that, as a very important extraterrestrial base. As many of you suspect, there are a lot of chambers still undiscovered. What is quite interesting is that the Sumerian texts – of course, Sumeria is older than Egypt – talk about the Great Pyramid. That alone would tell you that the pyramid is older than the Egyptian civilization. The pyramid was used in a lot of the territory disputes. It was considered the prized possession; whoever held that pyramid was the dominant ET group. Now I am going to stop here for a moment and we are going to talk about how important genetics were to these ancient ETs. Each ET group that was interacting with humans at that time felt it was very important to control the genetic mixture of humans on Earth. Ultimately, the ET groups wanted to create an advanced version of mankind that they could then begin incarnating into. So they tried to control the breeding on Earth for thousands of years. There is a very interesting creation story that comes from Egypt. It is the story of Osiris and Isis. The story put simply is this: Isis and Osiris were brother and sister and also husband and wife. The story says that Set, another Egyptian god, was very jealous and he sought to kill Osiris. Set found Osiris, cut him up into many pieces and scattered the pieces all over Egypt. Isis was so upset that she sought help of her colleagues and went about trying to find all of the pieces of Osiris to put him together again. The story says that she found all of the pieces except the phallus. But she was able to put Osiris together again anyway and he lived. Isis spent the night with Osiris and was impregnated. She was impregnated with Horus. You may wonder how Isis could have been impregnated if Osiris did not have a phallus. Well, who ever said these myths make sense? We are going to give our version of this story. Isis and Osiris were two of the most prominent ruling ET gods on Earth at that time. Set was also a very prestigious ET ruler, although he was secondary to Osiris. But Set craved power. He knew that if Osiris and Isis stayed together and had a child, that child Horus would be ruler and he, Set, would stay in the secondary position, so he had to find a way to kill Osiris. During this time the ETs had a lot of technology. He knew that he had to destroy the reproductive organs of Osiris, otherwise they could still produce offspring. We would say that the myth of cutting Osiris up and spreading the pieces around is really just a metaphor for the idea that Osiris was killed and his body was hidden. His body was hidden but not destroyed because Set believed that maybe some time in the future Osiris’ genetics could be used to his advantage. But the phallus was taken and put in another location. Now, Isis found Osiris’ body. Obviously, she could not have been impregnated by a dead husband with no phallus. [Germane laughs.] They did have a lot of technology then, though, and Osiris’ life was restored; but he could not reproduce in the usual way. So the legend says that they went up to the heavens but, of course, they went up to the ship. And what they did was take some of Osiris’ genetics and clone them with Isis’ genetics to produce Horus. Through a series of cloning and artificial insemination and processes that you are not familiar with here on Earth, Horus was created – they didn’t need the phallus to do it – and Egyptian history talks about the divine birth of Horus. So Horus was born and he became a very powerful ruler. Set, of course, was always angry. This is an example of how a myth that may not make sense does make sense if you look at it from another point of view. Earth history is filled with myths that seemingly do not make sense, but they really are stories of not only your extraterrestrial heritage but also of the adventures of your forefathers. Now let’s stop here. Many of the beliefs that mankind has had in the past several thousand years are directly a result of some of the things that happened in these ancient days. For instance, why is Heaven considered to be in the sky? Heaven has always been thought to be the realm of the gods. If you start thinking about this you will see that it becomes logical to assume that humans began to believe in a Heaven in the sky because the sky was where the ETs came from. Most of you in your present state of development now embrace the idea that God is not a physical person. He is not an old man with a beard. But, yes, these ancient people believed that gods came from the sky and had bodies like theirs. The ETs came from the sky so therefore the sky must be the place of the gods. You all know now the realm of God is everywhere, including within you, but back then they believed that God existed outside of you. Even today, humans struggle with that belief. Humans still believe, even if it is just on the subconscious level, that somehow God is outside of you and can’t be inside. Please recognize where that comes from. It is an old, old, ancient belief. And for most, it no longer serves you any more. Now there is one other belief from ancient times that is quite interesting and that we would like to talk about. In ancient times in Sumeria there was something that happened on a regular basis. When the gods were preparing for a space flight they would often have humans help them. Now we said that the gods used a form of cryogenics. This meant that the gods had to go into a deep sleep, and they had to do so before they left the Earth. So what they did was to go into their ships and have humans come and assist them. These gods would go into their cryogenic tombs which look very similar to your current-day coffins, and they would then go into a deep sleep which simulates death. Realize, first of all, that they needed their bodies to get into Heaven. They couldn’t get into Heaven without that body. Now the humans would also be there to assist the ships that landed with the gods in suspended animation inside. When the ships would land the humans would help these gods to awaken from their deep sleep. What they began to see then was that you had to go to Heaven in your body but you could also come from Heaven in a body as well. So, in a sense, they believed the gods were immortal; somehow this magical realm of Heaven preserved them perfectly. Eagles were a very common symbol for some of the Lyrans. Now it is important to understand that native peoples such as Native Americans also used animal symbology that was not necessarily connected to ETs, although it could be at times. How about the phoenix? This myth did not originate on Earth. Earth people did adopt it but the myth itself came from the Lyran civilization. It was a symbol for them that their empire would never be destroyed. It was a symbol that gave them power, and it was often used in battle as a power symbol meant not to frighten the enemy but to show their own strength. Did similar phenomena take place on other planets in this solar system? In those ancient days there were really only three planets that could support physical life: one was Mars, one was Earth and one was Maldek, which is now your asteroid belt. There were no humans on those planets. They were primarily ET territory. You mean Maldek and Mars. Yes. But in terms of physical life like you, none of the other planets had that type of civilization. Does that answer your question? Some people theorize there are civilizations on Mars. Some people theorize the Earth humans are actually creating civilizations on Mars. Well, that has been something that we haven’t wanted to comment on, especially since it is not the subject matter for tonight. That can open up a whole new subject. Simply, we will say that there are some things happening on Mars or in the vicinity of Mars now&lt – my goodness we have put our foot in our mouth – that it is very important not to talk about for the time being. Sorry to tease you with that information. It is a challenging road you have chosen, for until your planet embraces the knowledge of your heritage, many things may be misunderstood. There is another land on your planet that is full of mystery: the land of Peru. Peru has been the territory of the Sirians and the Lyrans, but its strongest connection is with the Pleiadeans, for they have been active there even up to present day. Peru performs a very important function for your planet. Tonight we have not spoken about Lemuria. That is a another long story. 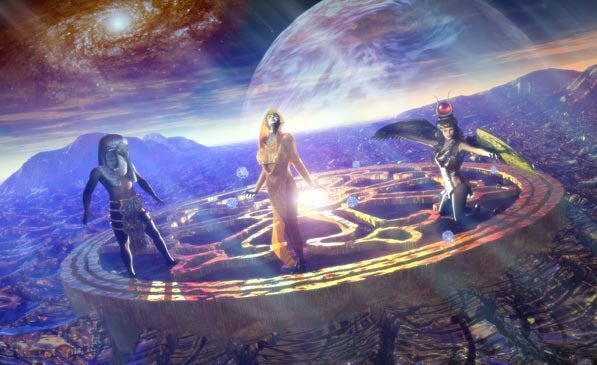 However, what we will say, simply, is that toward the end of the Lemurian civilization, the end of the Atlantean civilization was occurring, as well. They coexisted. The mystics of Lemuria knew that the end was coming. Knowing this, they also knew it was essential to begin preserving a lot of the wisdom and knowledge of Lemuria. They knew it was important that mankind eventually understand its star heritage. So the Lemurians began gathering all of this information and looking for a place to store it safely. The Andes of Peru were part of the Lemurian civilization, and the Lemurians knew that one very good place to secret those records would be in certain areas of the Andes, so they began seeking out natural caverns and power spots in which they could store some of the sacred knowledge. The mystics also began teaching the ancient Inca the mystical wisdom, for they hoped that the Inca would pass on the ancient wisdom throughout time. They also hoped that the Inca would protect the places where the records were kept. One of the major spots where records are kept is in the area of Machu Picchu. It is quite interesting that when the Spanish came, they infiltrated most of Peru but they never found Machu Picchu. The records that are kept in that vicinity are protected on many levels. Some of the present-day Incan shamans who are alive right now are protecting them. It is a tradition that has been passed on. Also, there are many in spirit form who protect the areas that are holding the records. At times in your history there has been release of information that could finally give you the truth about your heritage. One of these examples is in the Sumerian clay tablets. They were discovered and some were deciphered but unfortunately a lot of the information has been withheld. So those who guard Machu Picchu are very committed to never letting the records out until mankind is ready to accept those truths. Throughout time, it has been mostly the Pleiadeans who have come and checked to make sure the records are secure, for the Pleiadeans truly await the day when humankind accepts its galactic heritage. But since they cannot directly interfere, they can simply help to guard the records. Pleiadeans and the ancient Incans have a very, very strong connection. All over your planet there are storehouses of these ancient records so that your history will never be forgotten. And some of the extraterrestrial groups have been very instrumental in helping to preserve that information. The Native American Indians of North America are also a group that has helped to preserve the information from Lemuria. So have the Aborigines of Australia. The shamans of the Native Americans and Aborigines, even to this day, right now, maintain extraterrestrial connections. This is something that even most members of those tribes are not aware of. It is a sacred tradition passed on from the stars, from Lemuria, to these native peoples. There are many record-keepers on Earth. We have already mentioned some of the belief systems you have today, such as those about Heaven, and how they had extraterrestrial origins in the ancient past. The human race in some ways can be likened to an orphaned child. You have a rich, rich star heritage from many different extraterrestrial groups, but yet you have never been allowed to know your true parents. No one is keeping this information from you, but up until this point you as a people have not had enough desire to find out the truth. Many people on your planet have been secure, instead, in the illusions of their own religions. They may provide comfort; they may provide a sense of spirituality; but they do not provide the truth about your ancient heritage. We are not asking you to abandon your religions, for they are very important to you. However, look deep, deep within yourself and look for the truth of your origins. Seek to discover your true ancient family. In a sense, you will no longer be orphans when you do, and you will feel the joy of being reunited with a very vast family. The extraterrestrials who have guided you throughout history toward this discovery still await your willingness to meet them, but in order to meet them you must first begin to embrace the truth of your past. In a sense you are accurate and we will describe how. First of all, the journey from the Lyran system and all of its colonized planets took a very, very long time. It took generations. They did not have multidimensional travel. So the extraterrestrials who came here never went back and forth to their own planets. They could not do so in a lifetime. So for all intents and purposes, they lost the connections with their home worlds. And while their own home worlds transformed, they themselves did not necessarily transform with them because they were not there. So many of the Lyran and Sirian home worlds did transform from third to fourth density but these people who were colonizing Earth and the surrounding planets had no connection at all with that transformation. Was it not possible to have communication with the people on the home worlds? At that point in time, which was very ancient, these extraterrestrial beings were not very much more developed than you are now, so most of the population of extraterrestrials who were here did not have any telepathic ability at all. There were some in their societies like there are some in your societies now who could communicate telepathically and through forms of channeling. But for the most part, no, they were not telepathic. Some people believe that Japan was formed from very ancient civilizations. There are many pyramids in Japan even though they built of wood and stone. Also there are stone circles. Please talk about Japan’s ancient civilizations in relation to ETs. There were several civilizations that were the primary influence on ancient Japan. One is Pleiadian, which is the main influence. One is Vegan; it is a long story to explain how. And the third is Sirian. Oh my goodness, how do we answer the question without the whole long story? [Germane sighs.] Simply, we will say that there was a lot of extraterrestrial influence by these groups in ancient times in Japan, and some of your very ancient traditions were given to you by these extraterrestrial groups. Some of the ancient traditions of Shintoism came from these groups. My goodness, why don’t we leave it at this. If you have a more specific question about this we will answer it but the whole story is too complex to tell you. Do the Nazca lines have a connection to the Lemurian civilization? First of all, our perception is that some of the symbols that were made were symbols of the ET groups that were ruling in that area during Lemuria. This may sound rather odd, but do you know how they brand cows? Often they would draw symbols like that on the land so that any extraterrestrial group flying by would know whose territory it was. This was a tradition that began during the Lemurian era and continued after the flood. Some of the glyphs of the Nazca lines were symbols very predominant during the Lemurian era. We perceive that is what you are sensing. Is the drawing of the Nazca lines a tradition from the times of Lemuria? It is a little bit later. The actual Nazca lines that you see now were not made during the times of Lemuria but came later. They combined the tradition of the Lemurian symbols with other forms of communication. There is very little left on your world in terms of physical things left over from Lemuria. In ancient Japan there were two groups of people, Earth-based gods and Heaven-based gods. What is the difference between these? In Sumeria there were two main gods, Enlil and Enki. Enki was lord of the Earth and he had his own group of gods under him. Enlil ruled the areas of the heavens, and he had his own group of gods associated with him as well. This was a common theme throughout the extraterrestrial interaction with ancient Earth. There were gods assigned to the Earth territory and gods assigned to territory of the heavens which, of course, would be Mars and Maldek. So we perceive that the gods you are referring to had the same type of hierarchy – Earth-based and Heaven-based. Generally speaking, the gods who were based off the planet were higher in the hierarchy. In terms of categorizing the Earth-based gods and the Heaven-based gods, which were in Japan? Who were the Pleiadeans? We cannot put them into a category that would make sense to you without all the background information that was given yesterday. Excuse us. The ETs never had set boundaries such as Pleiadeans, Sirians. There were always mixtures in different groups that combined both energies, so the question cannot be answered in a way that would make any sense. The boundaries are not that clear-cut. What is the value of this interesting information? How can we put it to use? All throughout history, mankind has had nothing but conflict. Of course, conflict is always created within and then projected into the external world. We like to compare the Earth human relationship with ETs to a child’s relationship with its parent because it is the same dynamic. If a child is loved and nurtured and valued by a parent, it grows up in a healthy way. If a child is not abandoned, it grows up in a healthy way. If a child is allowed to develop its own identity and is supported by the parents, it grows up in a healthy way. If children do not have these things when they grow into adulthood they create conflict and pain in their lives; it really comes from the fact that they were not nurtured during their developmental years. At the times when these gods were interacting with your planet you were a child species. For the most part, you were not nurtured. Instead, you were controlled. For the most part, you were repeatedly abandoned. You would develop attachments to these ET gods and then they would abandon you. You were not encouraged as a race to develop your own planetary identity. Instead, the gods tried to mold you into what they wanted you to become. Now that the gods are no longer here and you are growing into adulthood, the species itself is experiencing pain and conflict. It doesn’t know its parents and therefore it doesn’t know itself. The species has never felt nurtured. Instead, it simply copied the dysfunctional pattern of its parents, creating conflict after conflict, trying to find itself. In traditional therapy, people will need to first confront the truth about their parents. They must learn why their parents were the way they were and how that has affected who they have become, and they must see how this parental influence has created the conflicts in their present lives. It is only then that they can be set free to find their true identity. Your planet is still trying to find its identity, for you are not a planetary people. You are, in a sense, a group of lost children. We mean this with no disrespect. As in traditional therapy, as we have just described, the human race itself now needs to confront who its parents were. The human race needs to accept that they have become who they are because of who their parents were. In accepting that they can begin to form their own identity as a species and finally come to peace with themselves. It is then that their conflicts will subside. So, all of the information that we have presented tonight is to allow you to know your parents. This is to encourage you to go proudly and boldly into the future. You can unify yourselves, but first you must know yourselves. First of all, thought always precedes actions, so it is more important to first change the thought. The details of the information that we have given are not what’s important; but those details make you think. As you think, your thought processes change. That is the first step and that is a step of action. Whenever you do not like your reality, you don’t need to change the reality, you must first change yourself. That is the first step. And when you take that step you will know naturally the next step to take. You cannot change others. You can only change yourself. We cannot really take more time to discuss this tonight but please know that the idea of changing your thought is very important. It is the first step. One by one, as your thoughts change individually, so do you transform your planet. Tell us about P’taah in regard to the dream spell. First of all, P’taah’s genetics were a combination of Earth and ET genetics, and that is a powerful combination because it is a unification of the Earth and the heavens. The intention of dream spell is to do the same thing – unite Heaven with Earth. So that is why you are sensing the similarity in the energies of P’taah and the dream spell. What is the most meaningful way of using the art of dreamspell? It is different for everyone. It is very important that you use it creatively and adapt it to yourself. That is how it was intended. Does that answer? What we said was very simple so listen to it again and think about it. The last question was somewhat appropriate for our closing remarks. You are all probably wondering how. Dream spell, in a sense, is something that humankind is now trying to awaken from, meaning that mankind has been asleep and dreaming. You have never awakened to your full heritage. You have never awakened to the truth about your being and thereby solved the conflicts within. But the fact that there are so many of you here tonight with questions about this says that mankind is finally awakening. Be patient with the process, be patient with yourselves. There is no rush. You are unfolding perfectly. You carry the memories within your very cells of all of these ancient civilizations. You also carry the memory of the stars within your cells as well. If you look within you will always find what you are looking for. Note: This session appeared in the November 1993 issue of The Sedona Journal of Emergence. © 1994 by Royal Priest Research, All Rights Reserved. This manuscript may be copied for private distribution, but may not be sold. For more information on available tapes, transcripts, books, and videos, contact Lyssa Royal.